Proactive technology of protection will defend your PC customers from malicious software and scams. This product will be idea if your customers are looking for reliable and simple antivirus. Use the link below to test the product. Choosing Zillya! Antivirus and making its rebranded version will allow you to enter cyber-market with reliable solution! Antivirus under Your brand will help you to increase Your brand power, extend the range of products in Your product portfolio, earn additional profits! Three types of scanning can now be run in parallel streams. Protection against malware is based on Behavioral (HIPS) and Heuristic analyses. 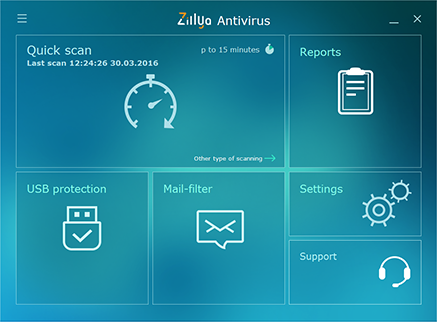 Real-time system ensures protection against malware in 24/7 mode. Prevents PC infection by scanning all inbox messages. Makes penetration of malware via removable drives impossible. Your customers will receive product with user-friednly and simple interface. Operating System - Windows XP (SP3), Windows Vista, Windows 7 (х32, х64), Windows 8 (х32, х64), Windows10 (for 32/64 bit systems).